Master just turned 6 is just about to finish kinder and become a big Prep boy next year. We held him back last year for a variety of reasons – best thing we ever did. His teachers have been truly phenomenal so to express our thanks I always like to create a little something for them at the end of the year. Last year I did a hamper with body products – salt scrubs, bath salts, sugar scrubs, and a few food items – some vanilla sugar and a fabulous All Purpose Spice Rub, along with a bottle of bubbles for good measure. This year I’ve gone all food – pastilla, dukkah, vanilla extract, some home grown bay leaves and kaffir lime leaves, nougat and the delicious Chilli Cherry Ripe. Oh, and a bottle of bubbles as well. For my overseas followers, a Cherry Ripe is an Australian confectionery item. In fact, one I owe the grand sum of $58,000 to. You see, last year I was on “Million Dollar Minute”, and one of the final questions for me to win was “What is the colour of the writing on a Cherry Ripe pack?”. Luckily I have downed enough of these bad boys in my life time to be able to tell you what it is… I had to choose from either Red, Yelllow or Green. Do you know what it is? So, naturally, the Cherry Ripe now holds a very special place in my heart. 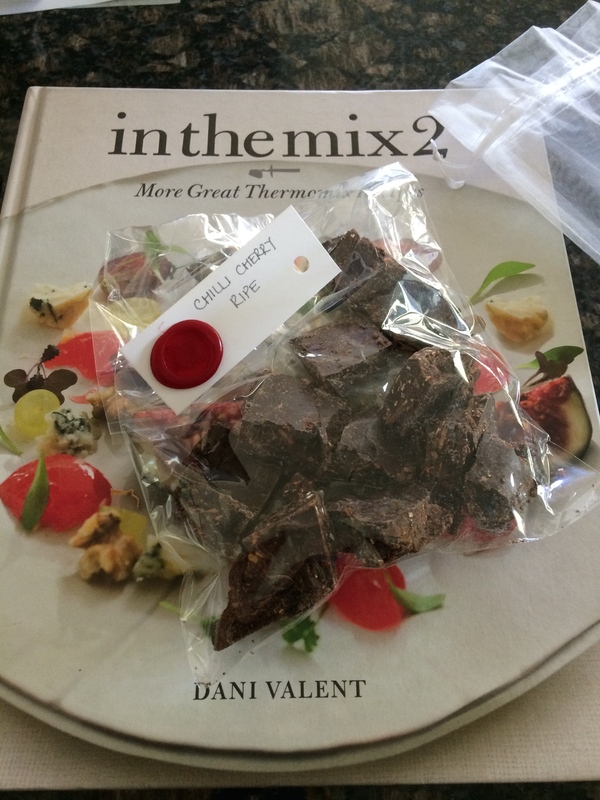 And when I saw the recipe for Chilli Cherry Ripe in In The Mix 2, I had to try it. This is the easiest recipe ever! Some dark chocolate, some desiccated coconut, some dried cherries and a small amount of chilli flakes. That’s your ingredients right there. My only hiccough was finding the dried cherries – which I eventually ended up getting at a Health Food store. I bought the tart ones as I like the way the sourness cuts through the dark chocolate. Anyway, you blitz your chocolate buds. I used the Yarra Valley Chocolate Company chocolate this time, which comes in little nibs. You blitz them for a while and then heat at 50 degrees until all the chocolate is melted, then whiz it around with no heat until the temperature drops to 37 degrees, throw in your dried cherries, coconut (I used shredded rather than desiccated) and chilli flakes. Whizz it around a bit more, and pour into a lined tin to cool. Bam! That’s it. Takes 10 minutes tops and then a couple of hours to harden and set enough for you to break or cut into pieces… taking all the ones you couldn’t possibly put in a nice cellophane bag for your neighbours and eating them yourself! I used the full two teaspoons of chilli flakes. It definitely has a warm aftertaste but not too much. I made two batches, which was enough for 8 small bags with a few sneaky pieces for the cook! Chilli Cherry Ripe makes a great little gift!! And.. if you want to know – the answer is yellow!